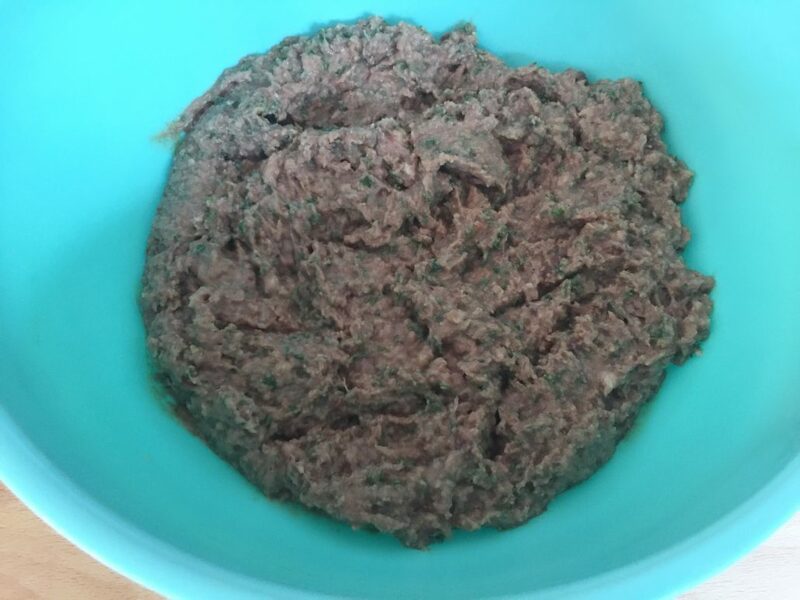 A German Liver Dumplings Recipe. The Liver Dumplings consist of liver, pork fat, onions, bread, herbs, and spices. 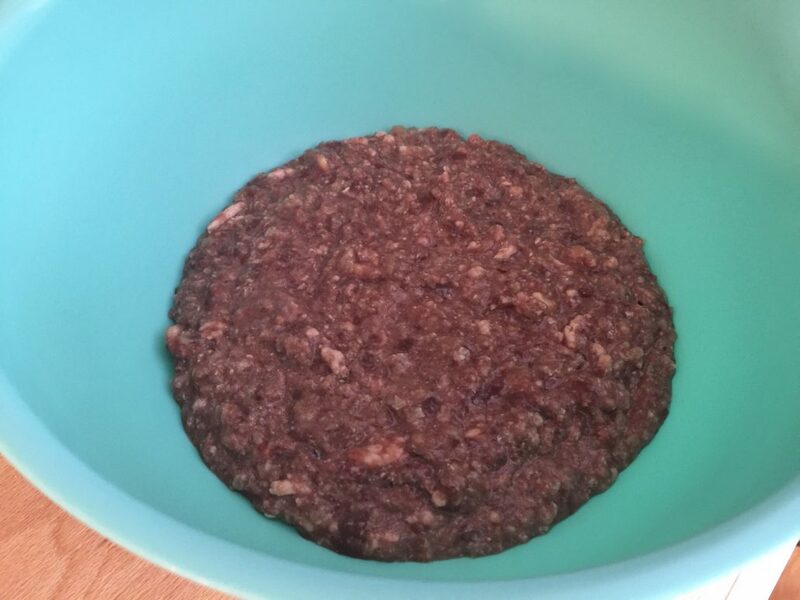 Liver Dumplings are called Leberkloesse or Leberknoedel in Germany. Heat the milk in the microwave for about 40 seconds. Place the roll or bread in the milk to soak. Make sure you turn the roll/bread from time to time. Wash the liver under running cold water and dry it with a paper kitchen towel. Make sure you remove any veins, before cutting into pieces. Peel the onion and cut it into chunky pieces. Remove the rind of the salt pork or pork belly and cut the meat into chunky pieces. Grind liver, pork, and onion with either an electrical or manual meat grinder and mix well. Wring the water out of the roll and add it the liver mixture. 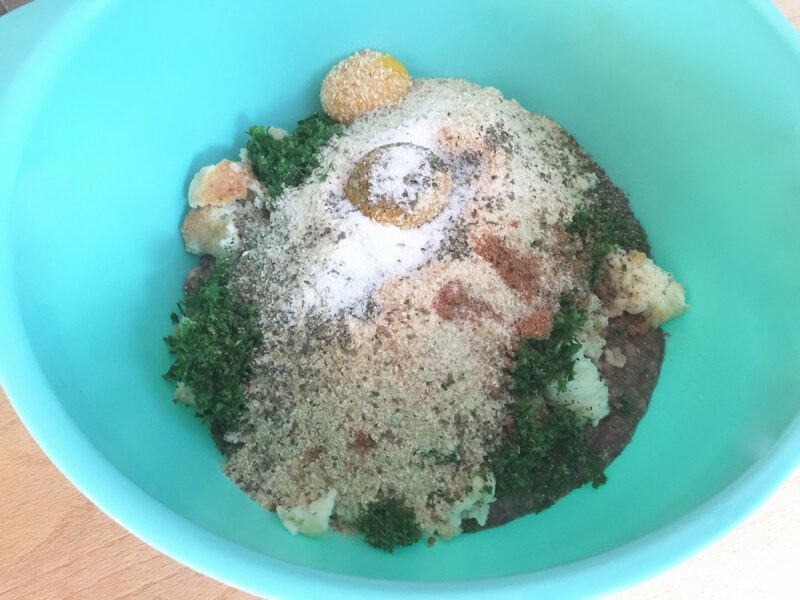 Add chopped parsley, egg yolks, bread crumbs, and spices to the mix. Use a handheld electric mixer to beat the ingredients until they are well combined. Cover the dumpling dough and let it rest for about one hour in the refrigerator. Bring about two quarts of beef broth to a boil. Portion the dumplings with a tablespoon, form them into small balls with wet hands and drop them in the boiling broth. Turn the heat down and let the dumplings simmer until they float to the surface. The water should simmer gently. Once the dumplings are floating on the surface, it takes another ten minutes, until they are ready. You can also serve these traditional Liver Dumplings in Oma’s homemade Beef Broth or Beef Soup. To try the Traditional German Semolina Dumplings click here, and the German Pancake Soup click here.